The big question for many organisations starting on NPI improvement journey is what should they do first? A good starting point is to do some internal analysis and identify strengths and weaknesses. This approach will not only be more cost effective but also help to see where to concentrate first level efforts for improvement. To facilitate this internal analysis a self-assessment tool can provide people time to take a step back, reflect and make decisions on where improvements are required. Only after this exercise a logical decision can be made on next steps to advance the capabilities and close existing gaps. Earlier this year Industry Forum launched a free NPI self-assessment tool to help organisations start their NPI improvement journey. Since launch of the NPI self-assessment tool we have received responses from cross sector (automotive, aerospace and diverse) in manufacturing. 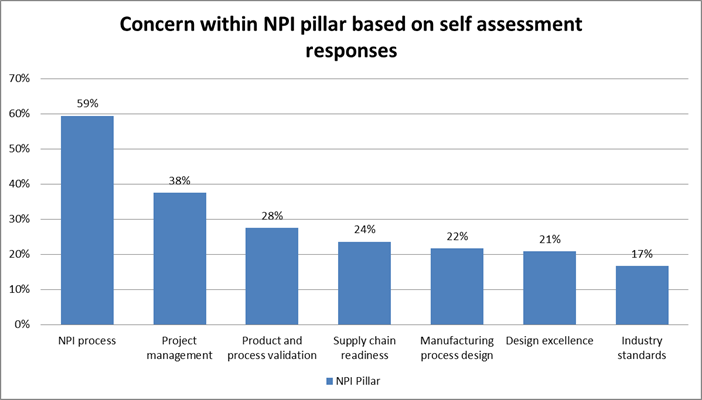 Respondents to the NPI self-assessment have been across most functions in organisation and include project management, quality, design engineering, manufacturing engineering, supply chain, senior management and manufacturing. Feedback provided by our experienced team at Industry Forum on each individual NPI self-assessment has been well received. We are confident that this process has been a great value to organisations truly looking to improve their NPI capabilities. In this article we will share some of the analysis results across the self-assessments completed and talk about common weak areas identified for improvement. Before we get to analysis results here is your chance to complete the free NPI self-assessment if you have not already done so. NPI process pillar is by far the biggest area of concern highlighted in NPI self-assessment responses completed till date. 59% of responses (see Fig. 1) within this pillar are an area of concern for the respondents. 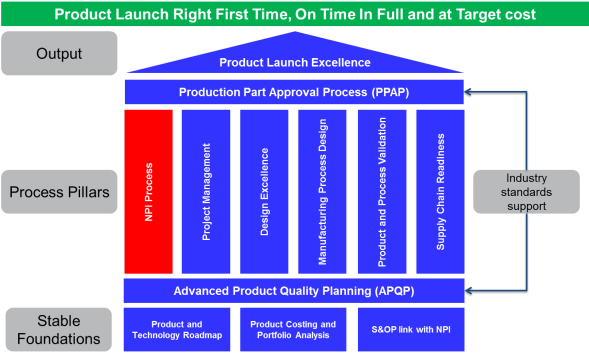 It is also one of the key process pillars in Industry Forum NPI model for launch excellence (see Fig. 2). A successful NPI process needs to be aligned to business needs and agreed with all stakeholders. Lack of stakeholder commitment is often seen either due to a cumbersome NPI process or not rigorous enough to produce the desired NPI results. This is also an area where best practices start becoming a best fit to organisations. 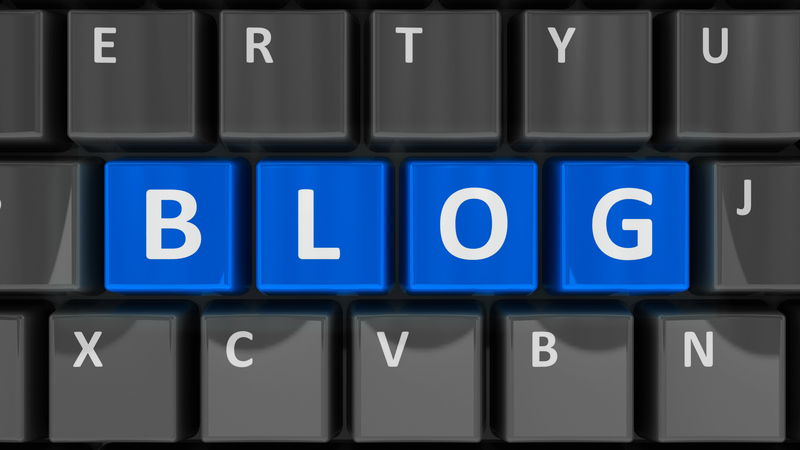 It all comes down to having a right sized NPI process that meets the business needs. So how do we get to this right sized NPI process?